Industry experts estimate that the drone industry will generate over $12 billion in the next few years. There is no denying just how popular both commercial and hobbyist drones have become. These days, businesses from nearly every industry are utilizing the power of drone technology. For years, construction companies have used drones for everything from surveying properties to gathering information used during the manufacturing for retrofits. Here are just some of the ways businesses in the construction industry are using drone technology uniquely. If you are a construction business owner, you know all too well how hard it can be to attract new customers. Having an effective marketing strategy and a great looking website are the cornerstones of a successful construction business. When having your website constructed, you will need appealing pictures to put on your pages. Hiring drone photographers to capture unique and eye-catching angles of your work is a great idea. These images can provide consumers with an idea of what you are capable of. Simply using stock photography on your site can cause major problems. The people who visit your company’s website are interested in hiring you, which is why you need to provide them with these one of kind representations of your skill. For years, professional sports teams have used films from their games to analyze how well they are moving as a cohesive unit. 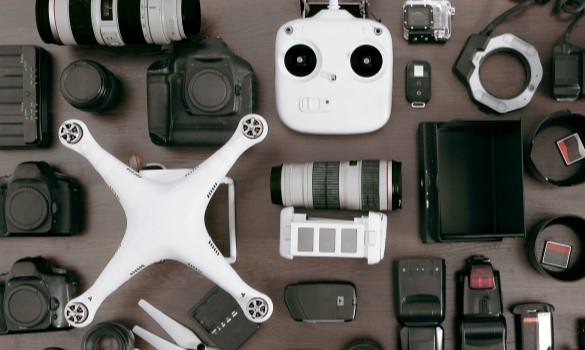 With the help of drones, your company can do the same thing. By using the footage from drones throughout a construction project, you can pinpoint issues that may be slowing your team down. The last thing you want is for productivity levels on your job sites to get reduced due to lack of information. This is why using resources, like drone technology, is so important. One of the best ways to attract new clients is by providing them with free estimates. Being thorough throughout the estimate process will allow you to give accurate quotes to your clients. If you need to assess the condition of a piece of property, you can use the power of drones to do so. Trying to give an estimate from the ground will severely limit your perspective and may lead to you making mistakes. Ideally, you will want to have information from all angles before committing to a price on a particular project. Often times, the money you pay for a drone inspection will be worth it considering the valuable information it can provide. For commercial roofing and masonry contractors, getting a look at hard to reach spots is essential. Instead of putting yourself or your team in danger by climbing up large structures, you can let drones do this work for you. An experienced drone operator will be able to provide you with detailed and high definition photographs of a structure. These photographs can be used to both diagnose repair issues and plan the work needed to address these problems. With the assistance of a drone photographer, a construction company can start a job with the relevant information, which usually means they will finish the job on or ahead of schedule. Before you hire a drone business, be sure to take a look at their previous work. This information can help you figure out whether or not a particular company is the best fit.